Product #21541 | SKU HS5 | 0.0 (no ratings yet) Thanks for your rating! Unlike studio monitors with added bass or treble frequencies which may sound more flattering at first, HS Series speakers were designed to give you the most honest, precise reference possible, providing an ideal sonic platform to build on throughout the mixing process. By combining acquired knowledge and expertise with state-of-the-art sound technologies, Yamaha's speaker engineering team have examined, then optimized, every aspect that has contributed to making these monitors the most trusted in the business. The second generation HS Series also adds a new 6.5" model to the lineup, bringing its exceptional accuracy to an even greater variety of recording environments. High-performance drivers and mounting system . The drivers used in the HS series monitors deliver superb audio performance that is considerably enhanced by a sophisticated mounting system. A scientific arrangement of screws and a specially designed mounting ring eliminate unwanted vibration and resonance, letting the speaker realize its full sonic potential without distortion or coloration. Yamaha selects their magnets to optimize solid low-end response. Tweeter frames use an advanced smooth-contour design that minimizes losses, letting you hear high-frequency details with stunning accuracy. The extra-thick tweeter frame also diminishes resonance that can interfere with treble clarity. The bottom line? Smooth, accurate response throughout the audio spectrum. And that translates to better-sounding recordings for you. Beefy magnets and an advanced magnetic circuit design . 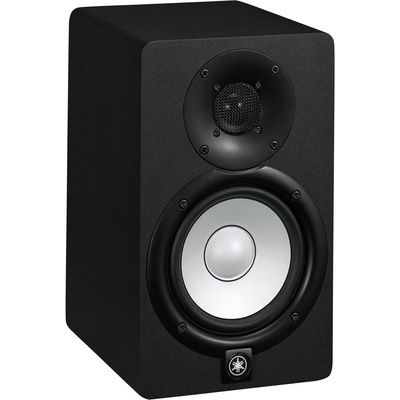 HS series monitors rock extra-large magnets. Why is this important? Glad you asked! In concert with the HS5's advanced magnetic circuit design, these beefy magnets deliver a robust, uniform, and tightly controlled flux field that yields exceedingly smooth response and dynamic efficiency over a wider frequency range. Optimum response in any room . HS series monitors deliver outstanding monitoring performance, enabling you to get your mixes just right. Even better, you can take your accurate monitoring on the road. The HS5 boasts Room Control and High Trim response controls that let you tailor your monitors to your room for optimal response. So whether you're in a control room or in a cramped remote truck, you'll always be able to trust your monitoring.